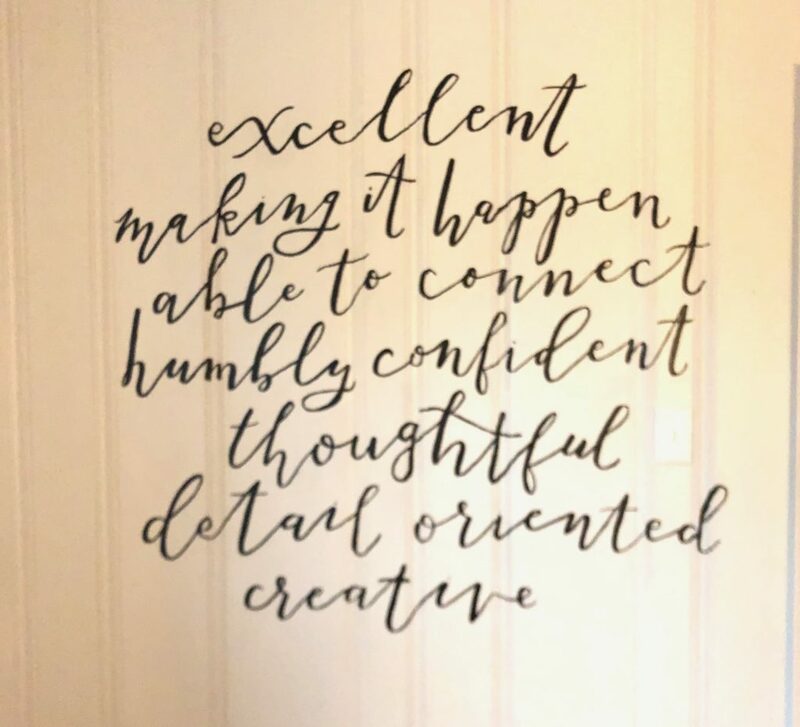 Setting Intentions for a Fabulous 2019! Fresh starts, goal setting, resolutions, taking stock of what works and opportunities for improvement…these are the possibilities that each new day brings. At the start of a New Year it is especially exciting to set clear intentions and challenge ourselves to grow and be better than ever before. We are ready to cultivate what matters! So here they are in black and white – literally – on our kitchen wall, so that we are motivated by their clarity each and every day! Excellent – We expect nothing less than the best effort from ourselves and from each other. Thoughtful – We use kind words, offer meaningful gestures, and provide helpful support. Creative – We believe that beauty transforms us and look for opportunities to incorporate our love of design in our work and in our lives. Making It Happen – We fill our time with action and take initiative to reach goals. Detail Oriented – We pay attention to the small things that will take tasks from ordinary to extraordinary. Able to Connect – We take time to share, listen, collaborate, teach, and learn. Humbly Confident – We strive for a balance between knowing there is always room to improve and knowing we are prepared to succeed. Leave a Comment Comments Off on Setting Intentions for a Fabulous 2019! The Holiday Season is upon us and that includes lots of celebrating here at Southern Studio! 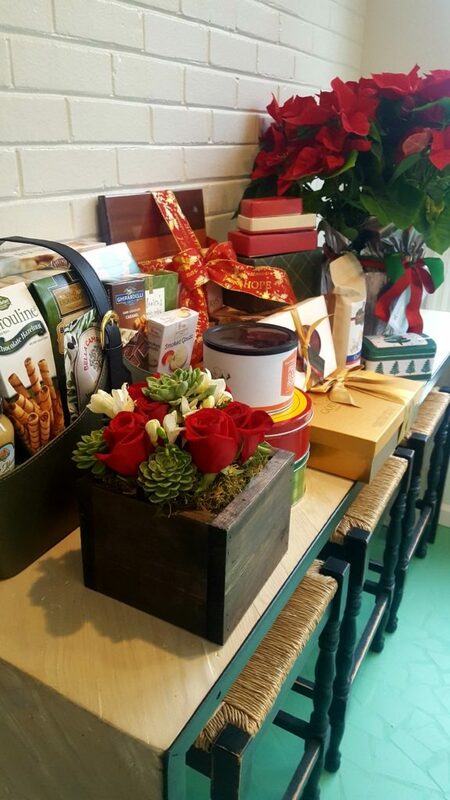 We have been showered with generous and thoughtful gifts from clients, friends, partners and vendors and although the glorious abundance may lead to some obvious New Years Resolutions, we are enjoying every bit of it! 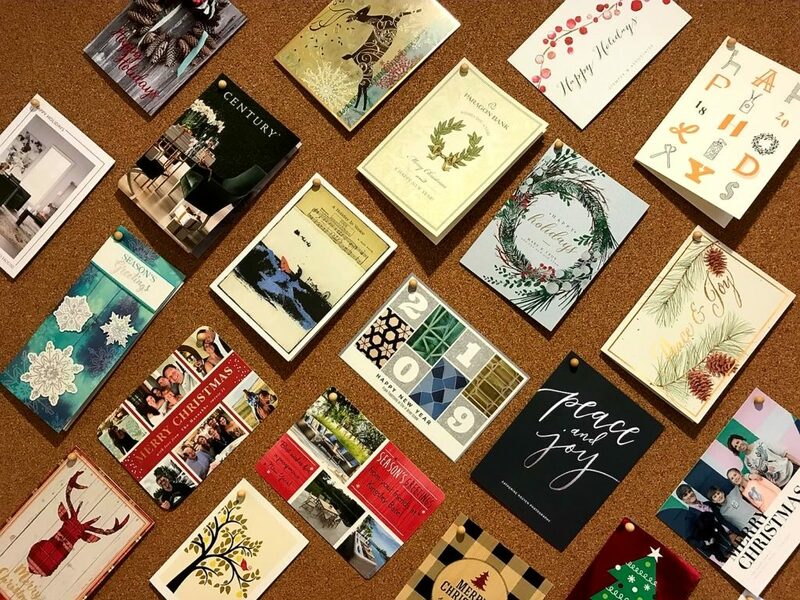 Connecting through cards and gifts is a wonderful reminder of the tremendous network of people and businesses we work with throughout the year to bring beauty and visions to life. As a studio, we gathered at the lovely Fearrington House to celebrate together. We enjoyed an amazing meal, toasted our team and our families, and gave thanks for the blessings of the year. 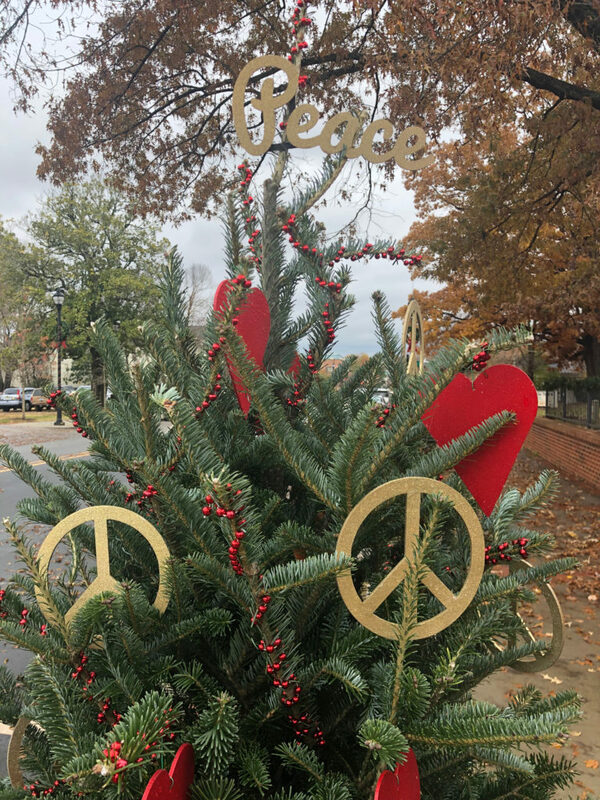 And as 2018 comes to a close, we hope that in addition to beautiful design, community involvement, and charitable giving, most importantly, we spread Peace and Love to all we came in contact with. Happy Holidays from Southern Studio! 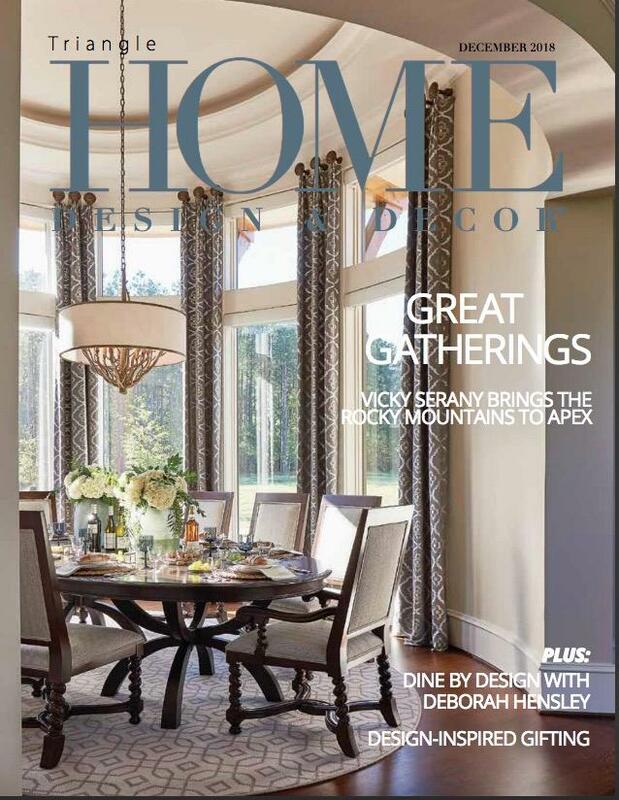 Just in time for the holidays, Triangle Home Design and Decor magazine has chosen a Southern Studio project for the cover of the Great Gatherings issue and included a full feature of the home! The 8000 square foot custom dream home (for amazing clients) was inspired by the family’s love of the Rocky Mountains and is full of classic architectural details and natural elements. Sit down, pour some eggnog and enjoy the full article here! Pictured on the cover is the oval dining room – the dramatic floor to ceiling windows allow a magical view of the peaceful property. The natural elements of stone and wood help to make this family room a cozy space to socialize with family and friends. 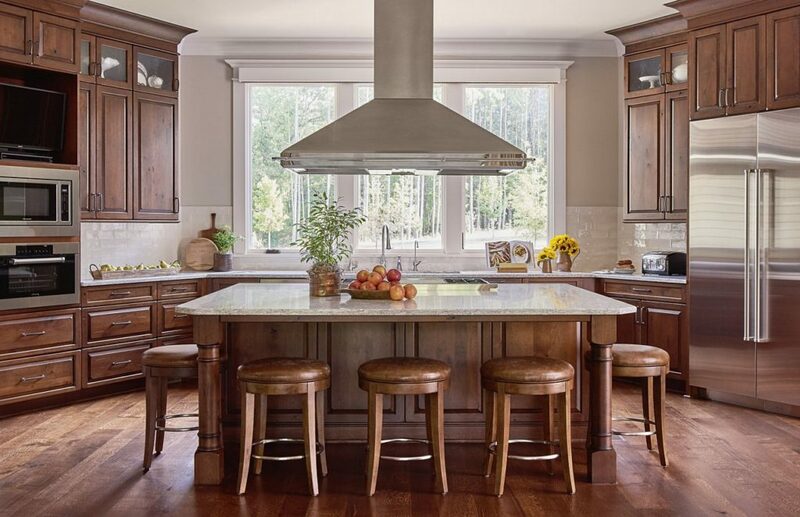 Both functional and beautiful, this is a kitchen worthy of great gatherings indeed! 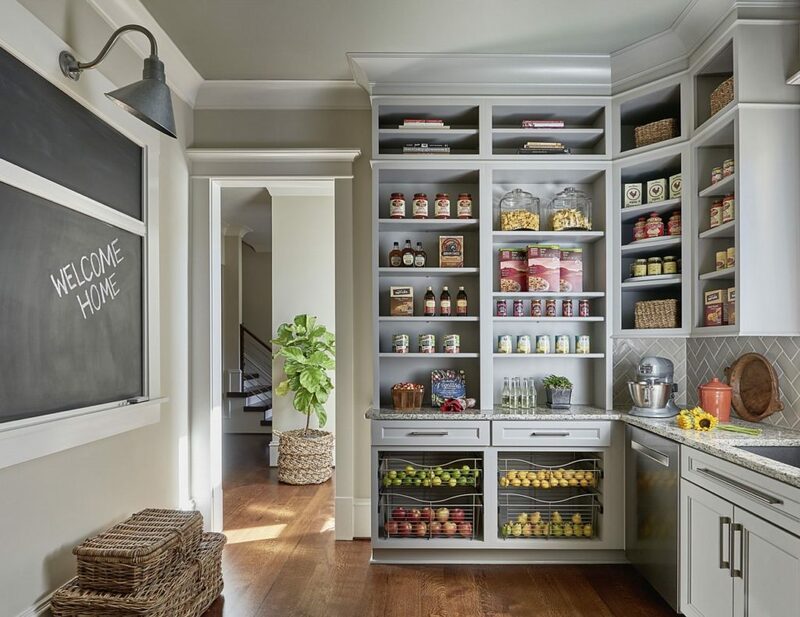 Tucked behind a pocket door, this stunning pantry effortlessly stores everything one could need for both day to day family life and large scale entertaining. 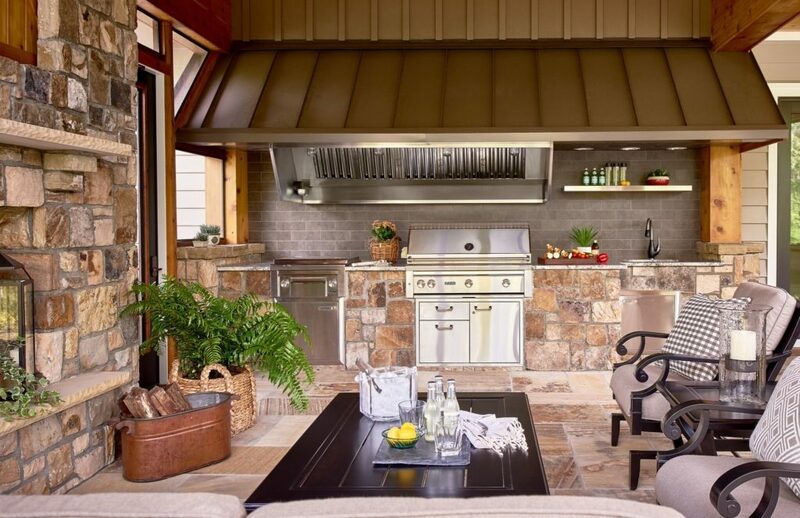 The magnificent patio features a fireplace for cozy winter evenings and an outdoor kitchen for year round fun. 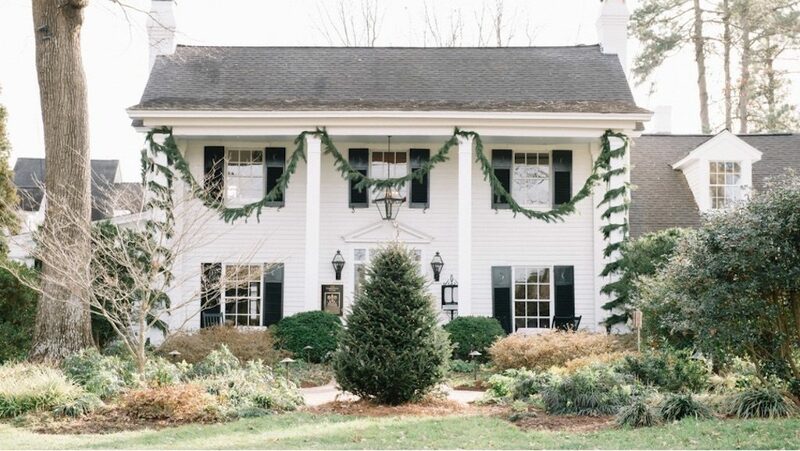 Several years in the making, this home is ready for Great Gatherings with family and friends this holiday season! Hot Off the Press! Southern Living Christmas Cookbook! 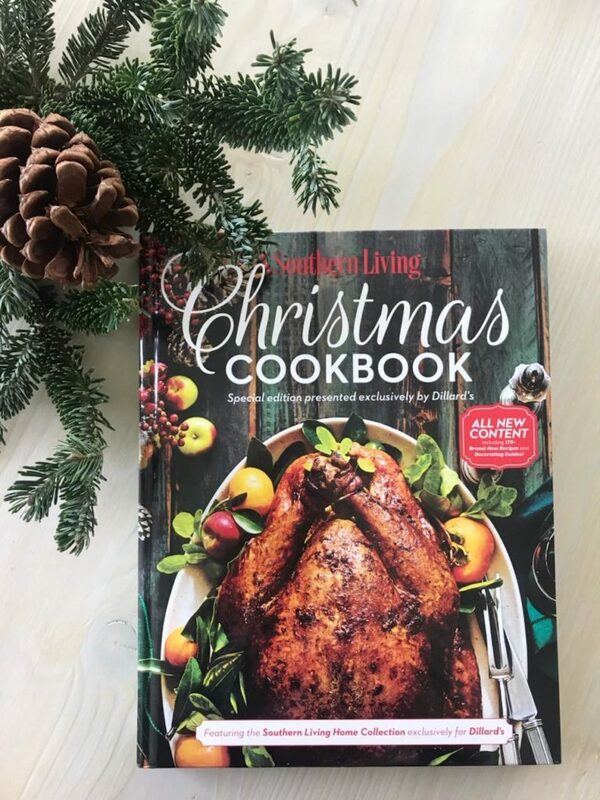 We are so excited to introduce the 2018 Southern Living Christmas Cookbook – complete with a feature page styled by Southern Studio Interior Design! It is a treasure full of recipes, gorgeous images, and inspired tips for the holiday season and other special occasions throughout the year. 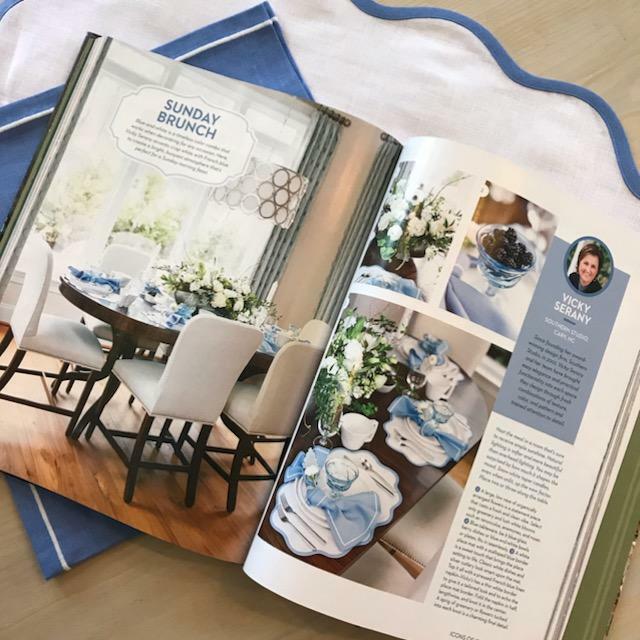 As a member of the Southern Living Designer Network, Southern Studio enjoys invaluable relationships with trailblazers, trendsetters, and icons in the design industry. 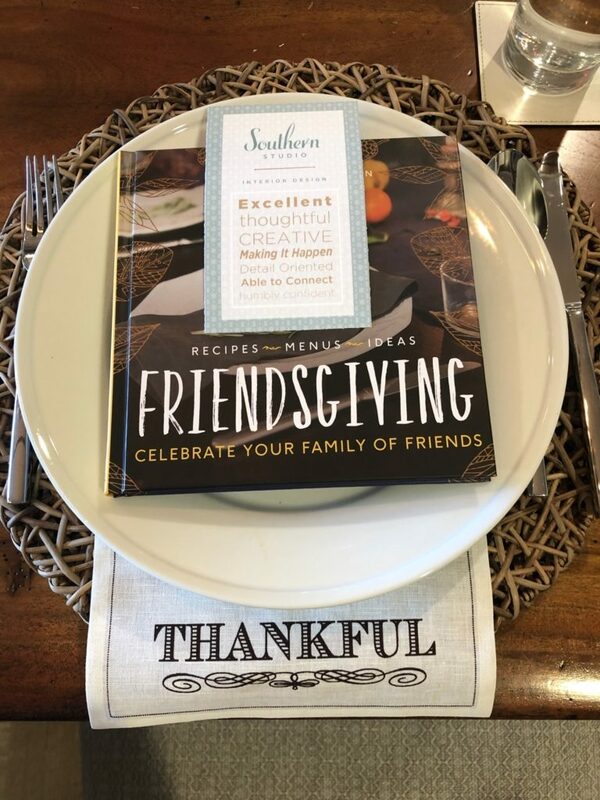 We hope you check out the cookbook for recipes, entertaining and decorating tips as you head in to the Holiday Season! Leave a Comment Comments Off on Hot Off the Press! Southern Living Christmas Cookbook! Thanksgiving has arrived at Southern Studio and as we bring our first full year in the Cary studio to a close, we took time to celebrate and reflect on all we have to be grateful for. 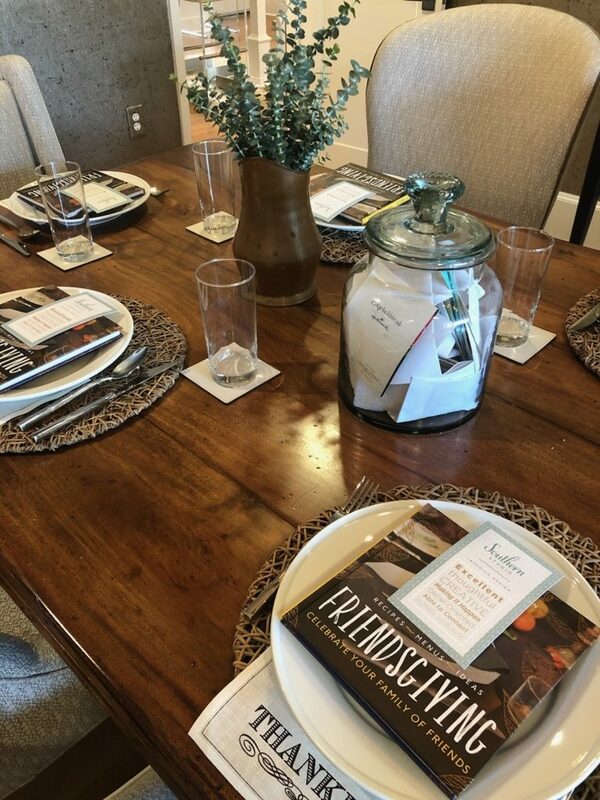 Filling the kitchen with favorite foods of the season, we sat down to the age-old pleasure of sharing a meal with friends! 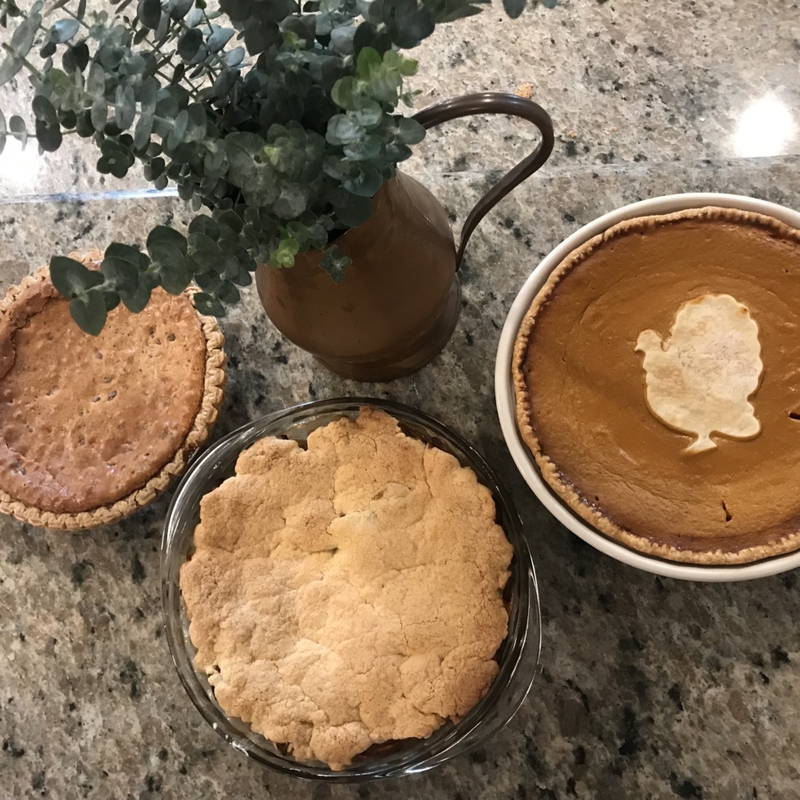 Turkey, stuffing, all the sides and 3 different kinds of pie….yep the whole shebang. No regrets! Throughout the year, we save emails, cards, and notes that are sent to us and place them in our Gratitude Jar. At the end of the year, we gather and read these together. It is humbling and inspiring, and also just so much fun, to think back on the projects, the clients, the challenges overcome, and the beauty and joy we got to be part of. Our Team – An Awesome Team of Amazing Individuals who feel like family; constantly encouraging, supporting, and celebrating each other! Our Studio – This space to nurture creativity and where we are so fortunate to host social, community and charity events. Homes are for sharing! 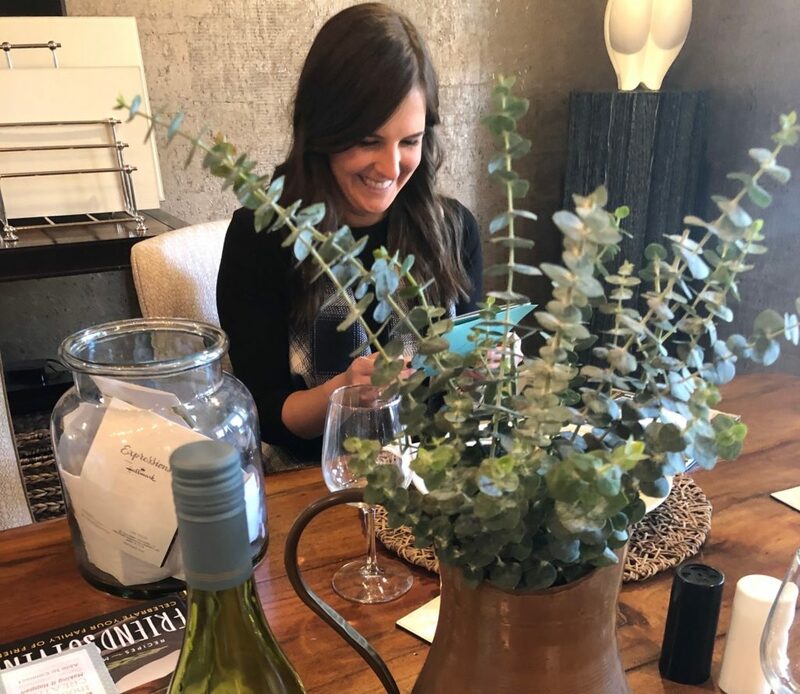 Our Clients – Who value design, welcome us in to their homes, and trust us to create functionally beautiful spaces for them. We have the BEST clients! Our Behind the Scenes Partners, Vendors and Local Artisans – Who create unique, beautiful and lasting items, and support us in bringing visions to life. The best in the business! As you gather around your Thanksgiving table, we wish you the joys of Gratitude. May we all be Thankful and Giving!